Chase has an unwritten “5/24” rule where you can’t get approved for a Chase card if you’ve opened 5 or more credit cards or charge cards from any credit issuer in the past 24 months. One of the big reasons for this post is because I often get asked if people should get “X” card over a Chase one. Let’s evaluate. How Much Is Each Chase “5/24 Slot” Worth? If you are under the “5/24” rule, currently 4 or less opened credit cards in the past 24 months, I recommend planning your credit card applications wisely. If you add the “wrong” card, you could easily pass up $500-$1,000 value in travel. The easiest way to determine the value of a 5/24 slot is to use an example of someone who’s currently at 4/24. If you’re only looking to optimize for cash back, the minimum value of a Chase slot is $150. The Chase Freedom and the Chase Freedom Unlimited both have a $150 intro bonus after $500 in spend within the first 3 months of account opening. Cash back is ideal for people who don’t care about travel and plan to redeem points for statement credits or cash. Looking at the above scenarios, if you’re currently at 4/24, I recommend getting the Chase Freedom card before the Uber card so you can earn an additional signup bonus. Ultimate Rewards can be redeemed for travel at a higher value when you have cards like the Chase Sapphire Preferred, Chase Ink Preferred, or the Chase Sapphire Reserve. The benefit of the Chase Sapphire cards is that they a downgrade path to the Chase Freedom cards after the first year. …but what about the Uber card? Dining spend has to be MORE than $20,250 for the Uber card to come out ahead (mathematically). Dining spend has to be MORE than $37,000 for the Uber card to come out ahead mathematically. There are a handful of exceptions for people who shouldn’t “fill” the 5/24 slots with Chase cards. If you’re someone who’s had a bad experience with Chase in the past, or you simply don’t care for Chase cards, then move on to other card issuers. Another scenario is if you’ve already added the cards you want from Chase, and you want to move on. People who have been banned or blacklisted from Chase also fall in this group. People who would benefit from another card immediately should go for it. A prime example of this is if you have a handful of Hilton stays lined up, and you would benefit from the Diamond status. In this case, I would recommend getting the Amex Hilton Aspire for the complimentary room upgrades, lounge access, and breakfast. The Diamond status would give you outsized value, especially if you are traveling to expensive resort areas like Bora Bora or the Maldives. If you’re in the late game and you’re circling back to Chase cards, the cards might not be a fit anymore. 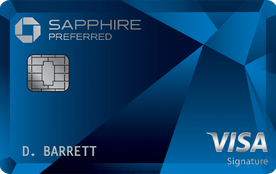 Chase Sapphire cards are limited to one signup bonus once every 4 years. At the end of the day, you are ultimately in the driver’s seat for your credit journey. Make educated decisions and pick the cards that fit your lifestyle.